In late 2016, The Register received credible-but-ultimately-unverifiable reports that Oracle was scaling back Solaris development, perhaps with significant sackings. We chose not to publish because Oracle denied the specific allegations we'd received. 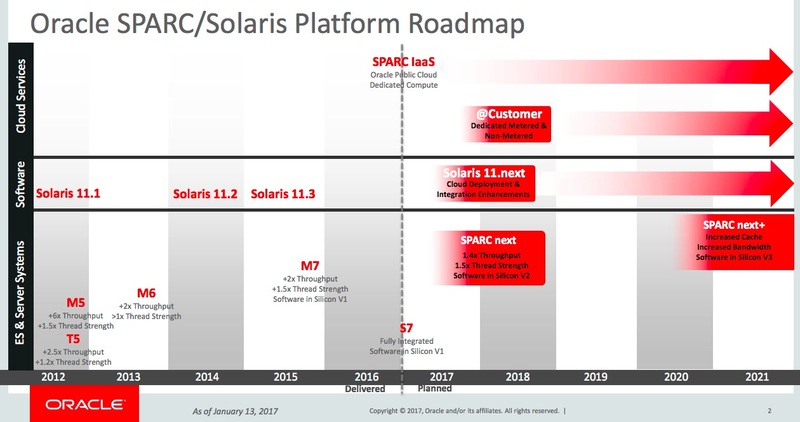 Now the company has published a new roadmap showing that there will be no Solaris 12. The new blueprint [PDF, or here on our servers if Oracle takes it down] – dated January 13, 2017 – omits any word of Solaris 12 that Oracle included in the same document's 2014 edition, instead mentioning "Solaris 11.next" as due to debut during this year or the next complete with “Cloud Deployment & Integration Enhancements." At the time of writing, search engines produce no results for “Solaris 11.next”. The Register has asked Oracle for more information. The roadmap also mentions a new generation of SPARC silicon in 2017, dubbed SPARC Next, and then in 2020 SPARC Next+. The speeds and capabilities mentioned in the 2017 document improve slightly on those mentioned in the 2014 roadmap. There's also hints of a plan to launch SPARC infrastructure-as-a-service, probably under the brand “@Customer” with services in “Dedicated Metered & Non-Metered” form. What does this all mean? At a guess, Solaris is not going to get a full new version, but will be enhanced and will be supported for many years to come. There's also going to be a SPARC-and-Solaris cloud that Big Red will rent by the hour or offer on other, more permanent, terms. We've asked Oracle to explain itself: if it comes back with anything useful, we'll let you know. In December, Oracle waved off suggestions that layoffs were looming and that Solaris 12 had been cancelled. Bootnote: A reader has offered us what looks like a quote of material Oracle has sent to customers, here.